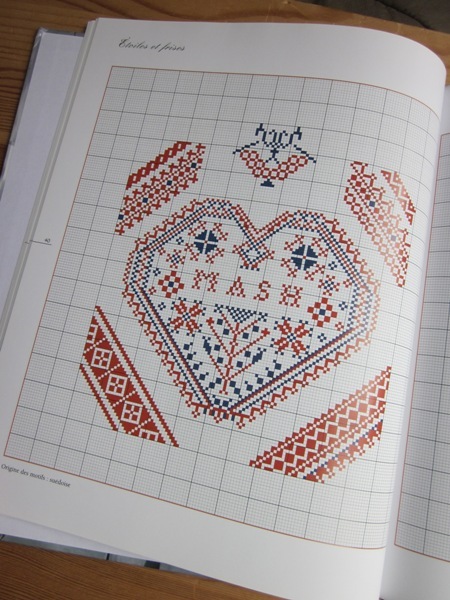 Moving forward in history a little bit from yesterday's Celts and Vikings... out-of-print books of Scandinavian cross-stitch designs! 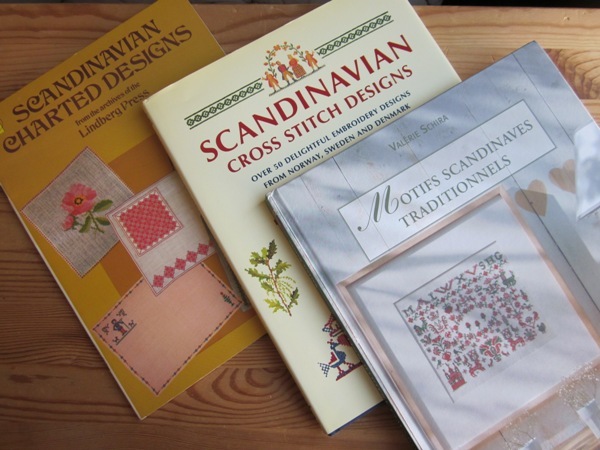 Left to right, we have: Scandinavian Charted Designs (Cross Stitch, Needlepoint) (Dover Needlework) , from the archives of Lindberg Press, Scandinavian Cross Stitch Designs by Jana Hauschild Lindberg, and a French title, Motifs Scandinaves Traditionnels, by Valerie Schira. 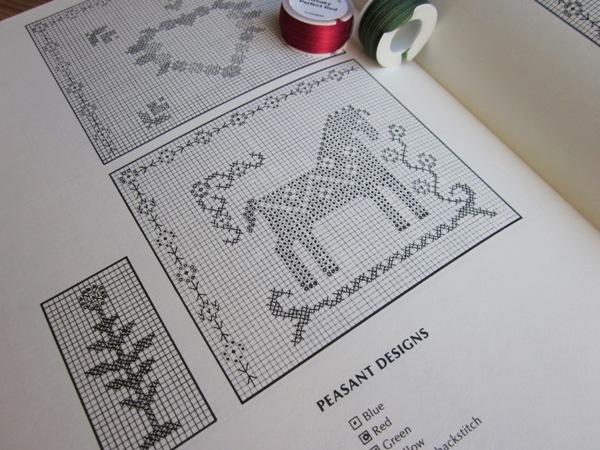 Scandinavian Charted Designs (Cross Stitch, Needlepoint) (Dover Needlework) is one of the Dover Needlework Series, and like all of the Dover series from the '80s, it has hand-charted motifs in black and white. 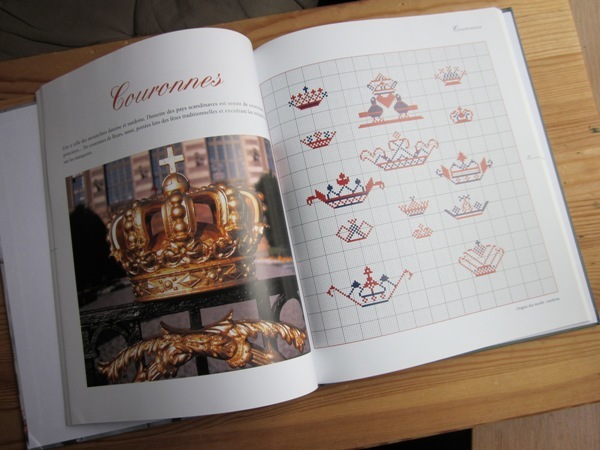 A few color examples are shown inside the front and back covers. This title focuses on floral and folk designs. 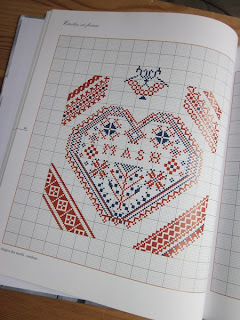 The folk designs are small, and there is one smallish folk sampler. I don't know if there is anything I will stitch in this book, but it is a good reference, was inexpensive and I do like this little horse quite a bit. Scandinavian Cross Stitch Designs is a larger book (128 pages) and includes larger-scale patterns from the Dover title, and has some beautiful full-color photographs. 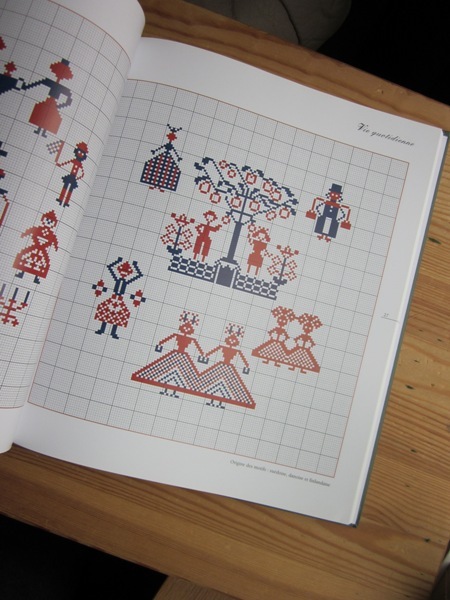 The patterns are varied, and range from designs based on ancient Viking sources, to designs based on Scandinavian embroideries and folk art, people in traditional dress, and more modern Christmas motifs. 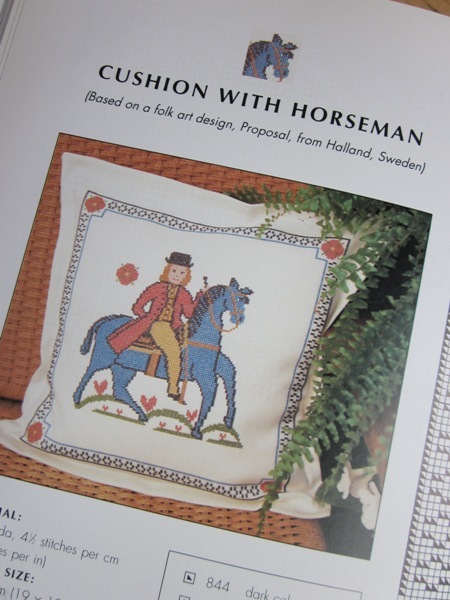 The charts are large and well-charted, and the projects themselves are varied, ranging from large wallhangings, tablecloths, and chair covers, to bookmarks and small framed pictures. Some of these are on my "someday" list. 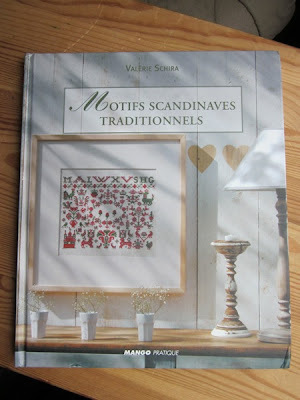 I purchased Motifs Scandinaves Traditionnels (no Amazon link) from Mad Samplar Books, a great source for those hard-to-find books like this one. 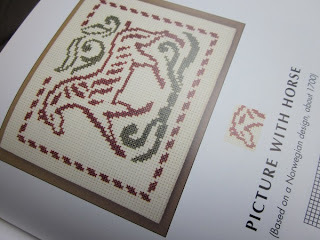 I've purchased several old European stitching titles from her, but this is one of the prettiest. Why is it that everything the French produce automatically feels more 'special' and sophisticated? Seriously, could the cover be any prettier? This is a gorgeous book. I can't read a word of it, but that doesn't matter. Full color photographs are at the beginning of each section. 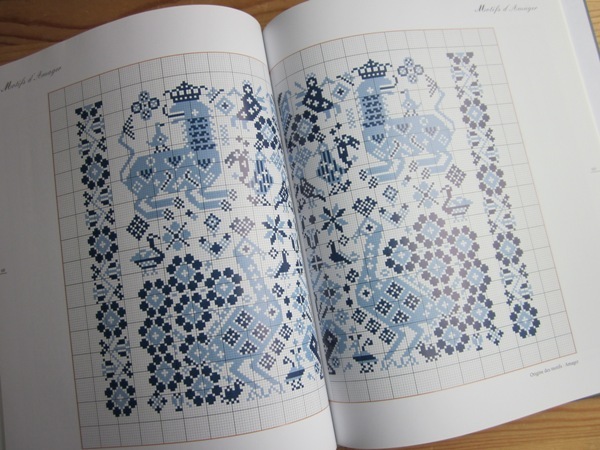 The motifs range from animals, to geometrics, to buildings an people, and even Amager samplers. They are are all charted in one or two colors, I love this style, and the freedom to pick your own colors and make it 'yours'. SO PRETTY. Next time, some non-traditional 'stitching' books! I wanted to get this book but can't find it anywhere Mad Sampler Books are all out of it..Do you have any suggestions? Ooh, I have the middle book and stitched the Christmas tree for my mother for Christmas last year. I love the patterns inspired by the medieval or earlier artworks. It's such a cool idea! 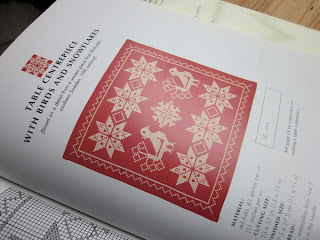 what an interesting stitching blog. you make fab samplers! from this post i found out about this french book with scandinavian motifs (i already possess the other two ;P ). i just found it on the net and ordered it from a french online bookstore. Cant wait to have it! looks very interesting. added your blog to my blogslist. I love this book. Took me years to find because it was out of print but the wait was worth it. Delighted to know we like the same books. I was led to your blog because of your stitching chair. I'm contemplating getting the same one.